Help simplify the electronic distribution of paper across a network with the Scan Kiosk II. When connected to a compatible imageFORMULA production document scanner,* the Scan Kiosk II is designed to provide businesses with the ability to create a high-volume networked scanning solution to help improve productivity and efficiency as part of a document management system. The Scan Kiosk II creates a networked scanning solution when combined with a compatible imageFORMULA production scanner,* specifically for business environments. Uses include centralized scanning environments, where documents arrive in a central location and are converted to digital information like in a corporate mailroom or copy room; for back-file conversion; or, as a day-forward “onramp” to multiple workflows. 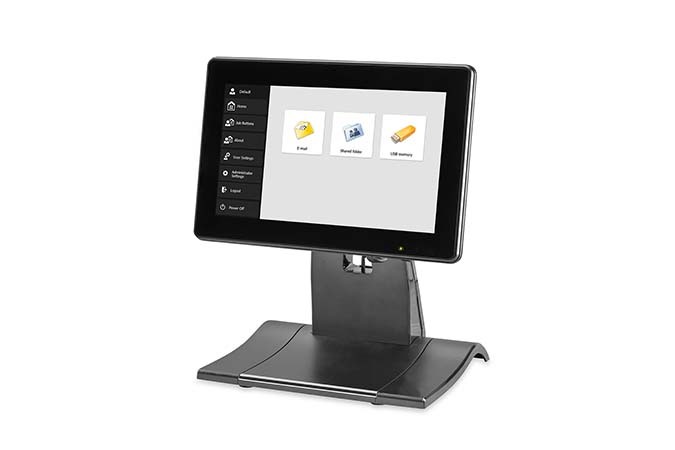 The Scan Kiosk II features a large, easy-view 10.1-inch, highdefinition, color touchscreen display mounted on a tiltable stand that fits easily on a counter or desktop. The Scan Kiosk II Interface allows for the configuration of file destinations on a network, so end users can easily scan directly to their chosen network folder. The interface of the Scan Kiosk II adapter allows administrators to control end user options and helps assist with data privacy and data storage policies. Scans can even be saved to USB memory sticks when inserted into the available USB slots.